Last weekend I was busy in London for BritMums Live hence the lack of Project 366 post. So this week I am writing a two week round up. 1 - Saturday 18th June 2016 - Some lovely homegrown strawberries. 2 - Sunday 19th June 2016 - Sunday was fathers day so I made one of the hubby's favourite meals Steak Pie. 3 - Monday 20th June 2016 - While I was in the garden I noticed this little fellow on the clematis, needless to say I moved him onto the honeysuckle that is covered in green fly! 4 - Tuesday 21st June 2016 - While I was shopping in Aldi the other week I found a paellera. I have wanted one for a while now so when I was they had one for just £5.99 I had to have it. My paella recipe will be live on Tuesday. 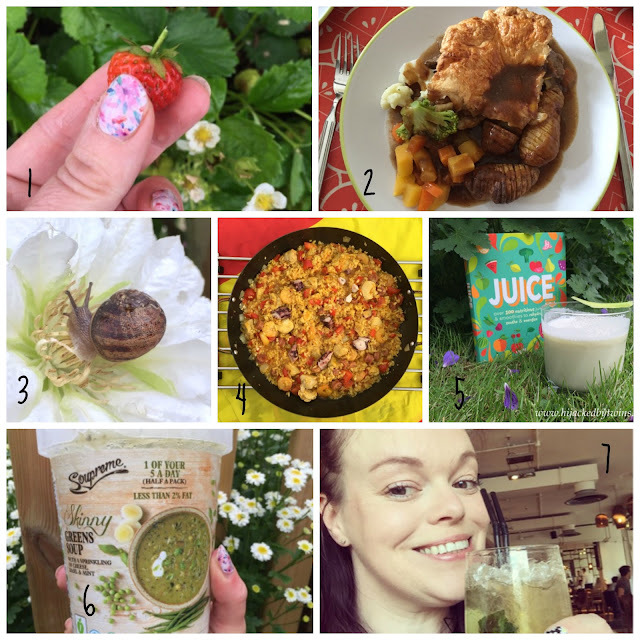 5 - Wednesday 22nd June 2016 - Wednesday was all about the Juice review! 6 - Thursday 23rd June 2016 - The other week I experimented using soup as a pasta sauce as it was such a success I thought I'd make another dish using soup which was just as tasty! Keep an eye out for the recipe coming soon! 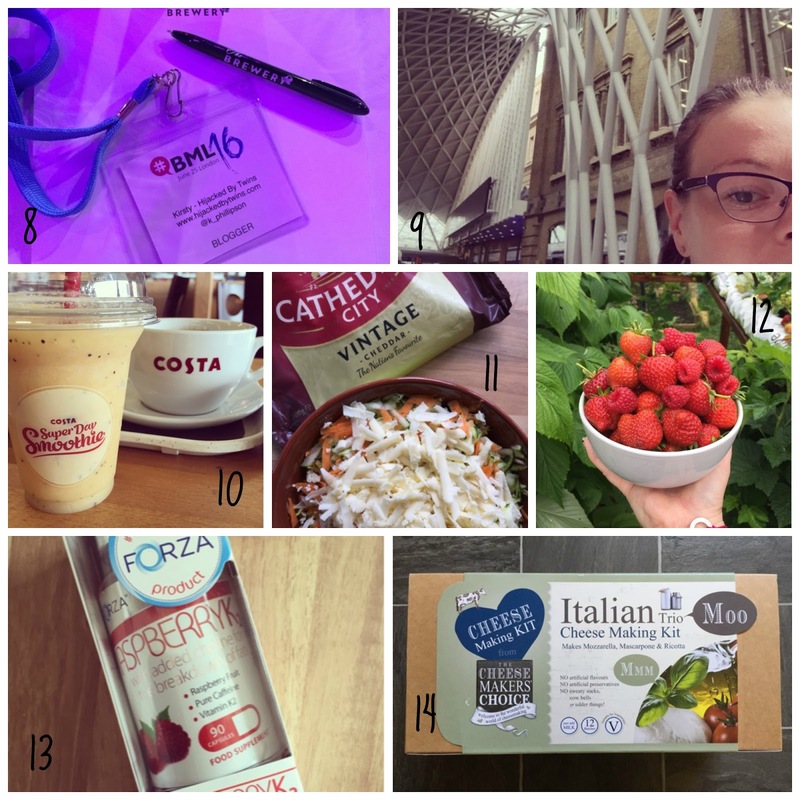 7 - Friday 24th June 2016 - On Friday I traveled down to London ready for BritMums Live. After a relaxing afternoon in the hotel room I met up with some lovely bloggers for some tea then went on to the BritMums Fringe Party before getting back to the hotel for some much needed rest. 8 - Saturday 25th June 2016 - Saturday was all about blogging, BritMums and friends. It was lovely to see so many friends and enjoy the whole BritMums experience! 9 - Sunday 26th June 2016 - After an early start thanks to the fire alarm going off at the Travelodge at 5am I was so tired! But Sunday was time to go home and it was so good to see the hubby and kids! 10 - Monday 27th June 2016 - It was lovely to have the hubby at home on Monday and we went to Costa to have a drink together while the children were at school. 11 - Tuesday 28th June 2016 - Back to blogging work after a few days off and writing a post and recipe for Cathedral City cheddar! 12 - Wednesday 29th June 2016 - On Wednesday I went to pick some fresh fruit that the hubby has grown and I was amazed by how many berries were ready. I had an overflowing bowl full of strawberries and raspberries! 13 - Thursday 30th June 2016 - For a final push to loose a bit of weight for our cruise I was delighted when I was asked if I would review some Raspberry K2. I have heard that they are great so I am curious to see if they work. So keep an eye out to see if they are as good as the celebs say! 14 - Friday 1st July 2016 - Wow we are in July! The kids break up from school this month, I cannot believe how quick this year has flown by! On Friday we made mozzarella cheese using The Cheese Makers Choice. You can read my review here! Our children broke up on Wednesday. Glad you enjoyed britmums. Would be nice to have a child free coffee with hubby. I would get on well with your hubby, quite adore a nice home made steak pie. Hi Kirsty, love your thumb nail colour. A Jamberry? You have had a busy two weeks! I bet BritMums was fab and as for all the cooking with cheese? I'm just a tad jealous! Was lovely to see you at BML. Those berries look great and numerous. I've never had success growing strawberries. Will be interesting to hear how you get on with the raspberry K2 - especially any downsides because you never hear about those. What a busy couple of weeks :) So sad to have missed BML this year, glad you had a good time! Lots of berries, fab! Finding The Perfect Car For A Growing Family! The Cheesemakers Choice - Make Your Own Cheese!